Combining the best elements of both a traditional textbook and a reader, it introduces such issues in art as its meaning and purpose; its meaning and purpose; its structure, material, and form; and its diverse effects on our lives. Its digital nature allows students to follow links to applicable sources and videos, expanding the students' educational experiences beyond the textbook. 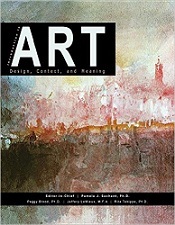 Introduction to Art: Design, Context, and Meaning provides a new and free alternative to traditional textbooks, making it an invaluable resource in our modern age of technology and advancement.